Overall, we think Blockchain evolution is a lot more interesting than any particular cryptocurrency. Blockchain has the potential to be incredibly disruptive. You can read more about that here and here. 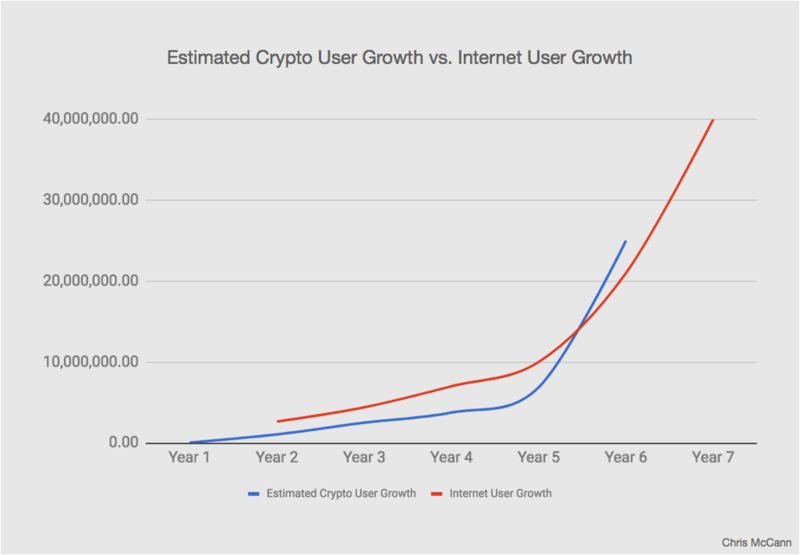 However, one question that comes up quite often is, “Just where is crypto/blockchain compared to the growth of the internet?”. The current stage of Blockchain evolution a difficult question to answer. But it is slightly easier to answer if you use cryptocurrency as a proxy, rather than trying to find usage numbers just for Blockchain by itself. I believe very strongly that we are in the early days of a new wave of technology and application. My usual answer is that, at best, we are in same stage as the internet of the late 1990’s. And of course, by “internet” I really mean the world wide web. The internet itself has been around for a lot longer than the web. Chris McCann of venture firm Greylock Partners recently took a stab at making a rational comparison, primarily using cryptocurrency usage data. You can read his Medium post about Blockchain evolution here. **Spoiler Alert** His conclusion is that we’re at ~1994. I don’t think he’s far off. We’re just getting started. You haven’t seen anything yet!